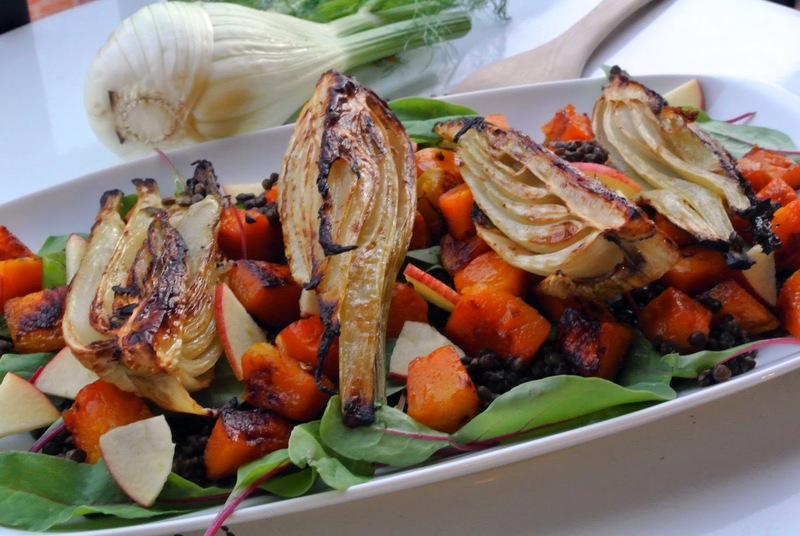 This dish is made of beluga lentils, roasted fennel and pumpkin. I have also added some fresh small chard leaves and raw apple. 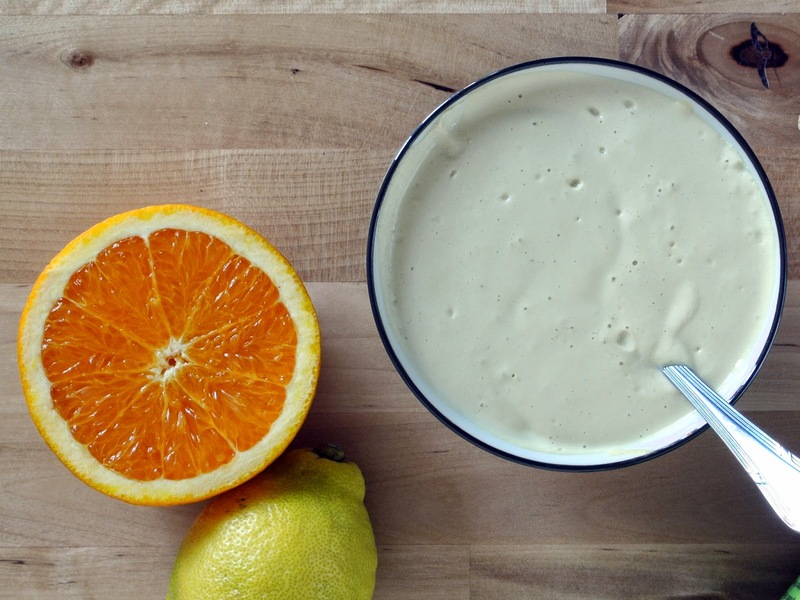 I always serve this dish with a sauce made of tahini ( sesame paste ), orange, lemon and ginger. The sauce is bursting with flavour and the roasted fennel and pumpkin become incredible while roasting in the oven. For this recipe you can choose any cooking pumpkin but I used a blue hokkaido pumpkin. If it is difficult to get hold of pumpkin you can also use a butternut squash. I have tried the dish with different pumpkins and butternut squash and all of them has turned out well for this recipe. Most important is to leave the fennel and the pumpkin in the oven until it gets a crispy, kind of caramelized surface. That’s where all the flavour is. I find this dish a bit festive and therefore I like to serve it when we have guests. You can eat it as a starter or as a main meal together with some bread and perhaps hummus. Serve it luke-warm with for example fresh pressed apple juice or apple cider. The beluga lentil is one of the smallest lentils and has a shiny black colour. It is very easy to cook and is great in salads and in soups. When it is cooked it looks very similar to caviar and that’s where the name comes from. 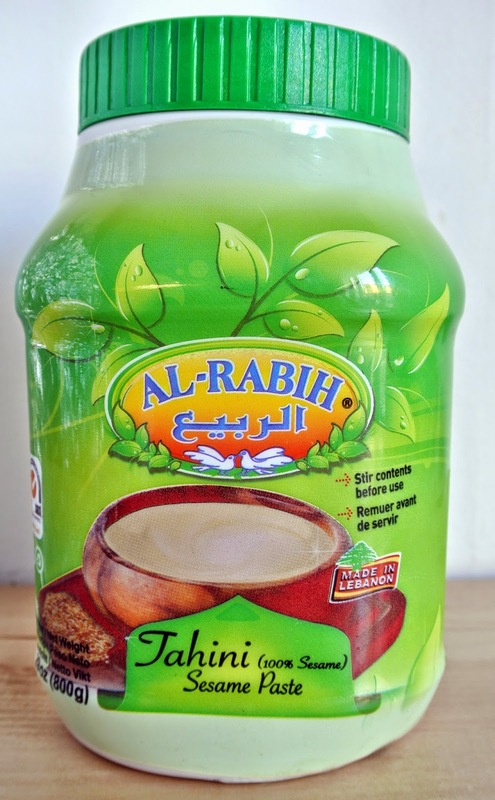 For the sauce I have used the type of tahini that you can see in the picture below. This type is very smooth and made from peeled sesame seeds. In Sweden where I live you can buy it in many supermarkets, you will find it in the section for foreign food. 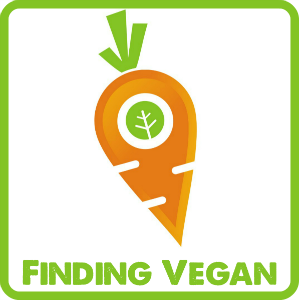 If not, you can always buy it in shops where they sell middle eastern food. It is staple goods in that part of the world. 1. Heat the oven to 225°C / 437°F. Cook the lentils according to the package. I always add one part lentils to three parts of water. I let it cook in low heat for about 15 to 20 minutes and then I leave the lentils in the water and let them soak for 20 minute or until cooled. This way they keep their shape and don’t become squashy. When they have cooled you filtrate the water and let them dry a little in a strainer. Once they have dried a little place them in a bowl and drizzle a tbsp olive oil over them and set aside. 2. When the lentils are cooking you prepare the vegetables. Start by removing the peel and seeds from the pumpkin and dice it in cubes. Put the cubes in a bowl and turn them around in olive oil, honey and salt. Make sure they are completely covered in marinade. Place the cubes on a baking tray covered in oven paper and leave a little room for the fennel. Cut the fennel in half and then in half again. You want four equally big pieces. Put them in a bowl and add olive oil, lemon juice and salt. Cover them completely in marinade and place them on the baking tray next to the pumpkin. Put the tray in the oven and bake the pumpkin for about 30-35 minutes or until it has turned a little crispy and caramelized on the surface. Leave the fennel a bit longer in the oven, for about 50 minutes all together until it has turned crispy and caramelized on the surface. My oven is a bit old but if you are an owner of a new oven you might want to decrease the heat a bit. But not to much, otherwise you won’t get the crispy surface! 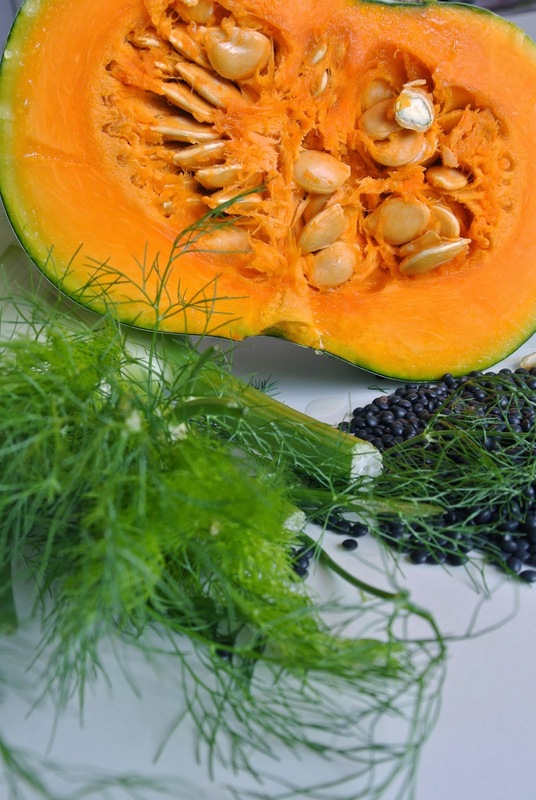 Since the fennel and the pumpkin won’t be done in the exact same time you have two options. You either let the fennel go inside the oven before you add the pumpkin or you take the pumpkin out before the fennel. In the latter case you might want to wrap the pumpkin until the fennel is done. 3. Place all the ingredients for the sauce in a mixer and mix until you have a completely smooth sauce. If you want to you can add a little extra water and make the sauce less thick. Pour the sauce into a small bowl. 4. Wash and dry the chard leaves and cut the apple in small pieces. Now it is time to build up your dish. Divide the lentils and chard over a big plate or tray and then the roasted pumpkin on top of it. Finish by adding the fennel and the apple. Drizzle a little of the sauce on top of everything and leave the rest in a bowl for your guests. Enjoy! This entry was posted in Main Course, Salads, Sauce Dressing and Dip, Side Dish. Bookmark the permalink. 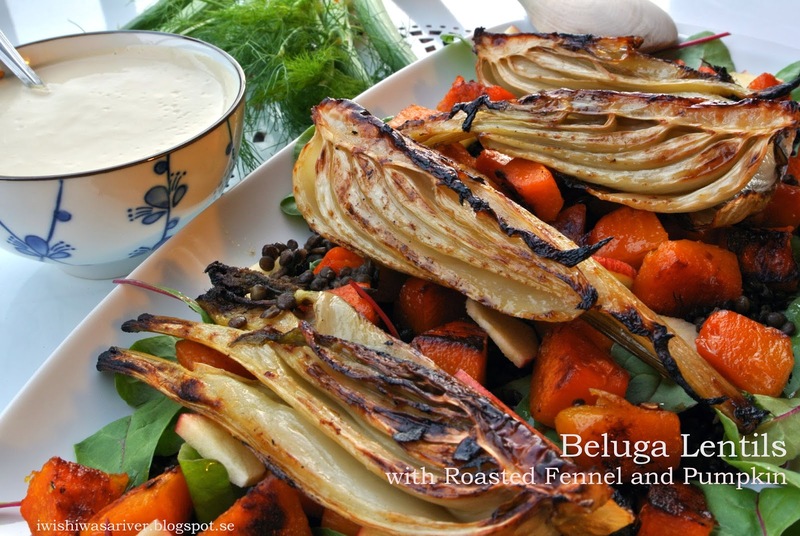 I love roasted fennel – these veggies look yummy! It is, I promise! The fennel tastes great with it’s caramelised surface.